The Calder mailbox is a really popular robust tapered contemporary design. Top posting slot under lift up lid. Excellent weather resistancy and security as the lock is hidden from view. The front of the box is a much thicker grade of steel than other boxes as this price point. Easily suitable for A4 size. 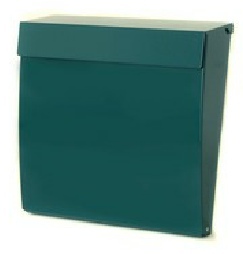 Available in a range of colours: Black, White, Green, Silver, Red, Stainless Steel.